Maybe it was due to the fact that both his parents died when he was 3 years old; or that he attended a boarding school located next to a cemetery. In fact, his gym class or maths lessons sometimes took place among the tombstones. He had drinking and gambling problems. His poem “The Raven” was inspired by Charles Dickens’ pet bird. Edgar Allan Poe was dismissed from the army for “gross neglect of duty”. He secretly married Virginia Clemm, his cousin, when she was 13 years old. She died of tuberculosis 11 years later. The author died under mysterious circumstances: he disappeared for one week on his way from Richmond, Virginia, to Philadelphia. He was eventually found in Baltimore, drunk and wearing somebody else’s clothes, and was taken to a hospital where he died a few days later. Only 7 people attended his funeral. 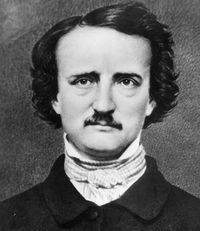 Edgar Allan Poe passed away 10 days before his wedding to Elmira Royster Shelton. His beloved cat Catterina died at the same time as him.